plants and Pharmaceutical Sciences in general and on education of AYUSH sector in particular. Suresh Kumar, R.H. Singh. Call for Authors. J Res Educ Indian Med . 2010; 16(1-2): 1-1. Suresh Kumar, R.H. Singh. Call for Authors. http://www.jreim-ayushjournal.com/?mno=192166 [Access: April 25, 2019]. Suresh Kumar, R.H. Singh. Call for Authors. J Res Educ Indian Med . (2010), [cited April 25, 2019]; 16(1-2): 1-1. Suresh Kumar, R.H. Singh (2010) Call for Authors. J Res Educ Indian Med , 16 (1-2), 1-1. Suresh Kumar, R.H. Singh. 2010. Call for Authors. Journal of Research and Education in Indian Medicine (Est.1982), 16 (1-2), 1-1. Suresh Kumar, R.H. Singh. "Call for Authors." Journal of Research and Education in Indian Medicine (Est.1982) 16 (2010), 1-1. Suresh Kumar, R.H. Singh. "Call for Authors." 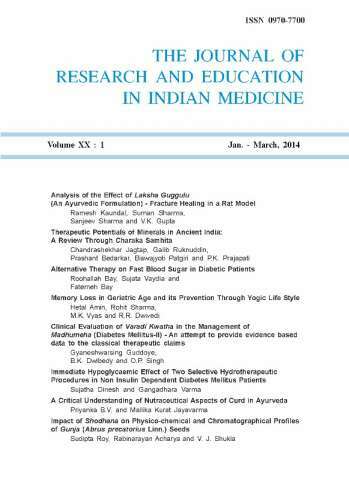 Journal of Research and Education in Indian Medicine (Est.1982) 16.1-2 (2010), 1-1. Print. Suresh Kumar, R.H. Singh (2010) Call for Authors. Journal of Research and Education in Indian Medicine (Est.1982), 16 (1-2), 1-1.